How will this personalization guide help me and my business? Everyone has seen and experienced Amazon's web personalization and knows about the power of delivering persuasive, relevant, contextual offers across the customer journey based on site visitor behaviours and profile. Until recently, because of cost and complexity, web personalization has only been available to larger organizations, often limited to the retail ecommerce sector. Today, cost-effective personalization is readily available to all B2C and B2B companies through low-cost, easy to implement personalization tools. Research featured in the report shows that around one third of businesses deploying personalization are gaining between 10 and 30% uplift in conversion using personalization through the customer journey. Examples of the uplift possible from more persuasive, relevant dynamic web content at relevant points in the onsite customer journey for B2B and B2C sites. 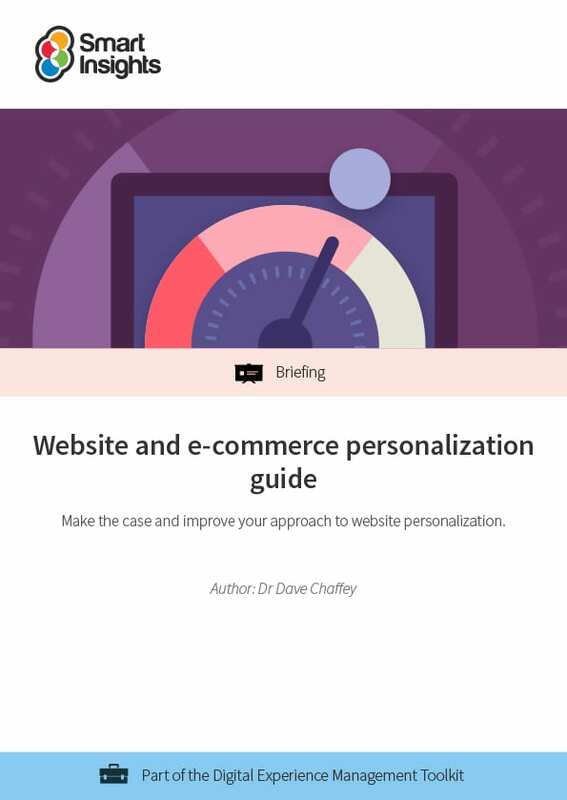 An in-depth exploration of ecommerce personalization options with 19 tactics to boost the effectiveness of your e-commerce site. A set of recommended tools and services to get you started with web personalization or optimise your existing efforts. Format: Elearning topic: 6,000 word guide with strategy recommendations, best practice tips, tools and examples. This online guide is a detailed topic which is part of our actionable Digital Marketing elearning course structured around our RACE planning framework. Sectors covered: Many of the examples in this course are retail ecommerce related, but the techniques and tools mentioned can also be applied to other types of site including travel, financial services and business-to-business. Unlike our e-book guides downloads, our e-learning topics do not have to be downloaded, and can be accessed directly on the site from the members’ area. This is Convert topic 4.2, Web personalization from our RACE Digital Marketing Planning E-learning module. Individual and Business members get full access to this and 10 other guides in the Digital experience management Toolkit.